I was going to say you wouldn’t find a Ferrari with 126,000 miles under its wheels, as one particular 1995 Honda NSX Targa F-Matic auto can claim (it’s up for £31,995) – and then I came across a 1998 Ferrari F355 GTS (£45,000) with 151,000 of them. Given that some Ferraris are driven around the block just once, that’s impressive. However, to date, this F355’s workshop receipts total £80,000. I’m willing to bet the NSX, a former Honda press car, has had no more than a quarter of that sum lavished on it during its 22 years. It comes with every bill and receipt, so it should be easy to establish exactly how much. Not only that, but while a high-mileage Ferrari is the exception, leggy NSXs are relatively common. For example, at the time of writing, of the 23 NSXs for sale on Pistonheads, four have done more than 100,000 miles and seven well over 50,000. Given that there are fewer than 300 NSXs in the UK, that’s an impressive number because it illustrates not only how usable the NSX is as an everyday supercar, but also that owners love their cars so much that they’re happy to ignore the temptations of the heated garage, as well the overheated sales showroom, and drive them. Ayrton Senna would have liked that. He tested prototypes at Suzuka, feeding his impressions to Honda’s engineers and development drivers, who were themselves a talented bunch. His association helped validate the NSX, important given Honda’s brief that it should match, if not exceed, Ferrari’s V8 models. Development began in 1984 and the NSX was finally launched in 1990, powered by a mid-mounted, all-alloy 3.0-litre VTEC V6. It produced a lowly 270bhp but the car weighed only 1400kg. Like the rest of the aluminium-bodied and suspended coupé, it was handbuilt. There was a choice of five-speed manual or four-speed automatic transmissions, with power sent to the rear wheels via a limited-slip differential. A later version of the automatic ’box, called the F-Matic, had flappy paddles. The interior looked space age but shared many parts with more common Hondas, which at least guaranteed reliability, familiarity and ease of use, qualities that would define the NSX. The Targa-style NSX-T with a removable roof was launched in 1995 but it wasn’t until 1997 that the NSX was given a major refresh in the shape of a more powerful 276bhp 3.2-litre V6. It was reserved for manual transmissions (now with six speeds) while the auto continued with the standard 3.0-litre engine. In 2002, the model’s pop-up headlights gave way to fixed affairs and then, three years later, production ended. Today, a rare, 2005 3.2-litre coupé with around 40,000 miles costs from £85,000, while prices for the earliest and leggiest cars start at around £30,000. Five years ago, you could take £10,000 off that figure. The lesson? If you want to own the world’s most exotic daily driver, buy now before you can’t afford to. As we’ve mentioned opposite, even a leggy NSX will wear its miles well. But our test car isn’t a leggy NSX. In fact, it’s Honda’s own car, which rather explains its remarkably low mileage of 30-odd thousand. 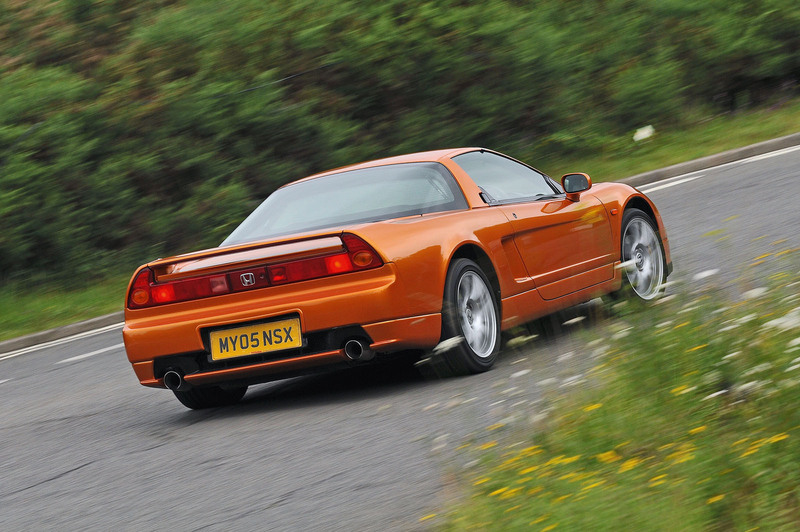 By the time this example was in the showroom in 2005 – the year of the NSX’s demise – it was up against much more modern rivals than it had been when it was released in 1992. Climbing inside must have seemed as much of a trip back in time as it is today. The black plastics, cramped quarters and horizontal lines feel positively ancient. It doesn’t matter, though, because the view out is unique: two humps of bodywork framing the view, the low-cut screen affording you superb visibility and, behind, that wide, flat spoiler. No flashes of rocker covers in the rear screen, though. This is a Honda, after all, so usability and practicality are more important here than the showmanship of a contemporary Ferrari. On the move, it’s the same. The NSX is brilliantly docile. Sure, the ride is a little firm, but never uncomfortable, and anyway, this is a supercar, not a grand tourer, so who cares? In town, you get light steering and smooth, easy-going pedals, and the NSX feels dainty, too, meaning threading it through width restrictions is nowhere near as intimidating as you’d expect. I’m not going to borrow from the well-worn book of motoring hacks’ clichés and call this a Jekyll-and-Hyde car, because it isn’t. The NSX doesn’t switch character when you decide to press on a bit. In fact, just as it works with you when you’re pootling around, the same goes for when you’re making progress. That light steering gains feel, although not weight, and reacts directly, allowing you to place the front end perfectly. Through every bend, the car rotates beautifully, a sign of its exceptional balance. It feels balletic. Every movement becomes exactly measured and you sense the car stretching not just its legs but its toes, too. And, good grief, that V6 is addictive. The tone is induction – heavy; a sweet, metallic squall that grows more urgent with the revs. Same goes for the power, which simply seems to bloom the more you hold onto each gear. This engine positively implores you to wring its neck. What’s more, it’s just so strong throughout the range that you feel confident that you can do so without risking the car’s reliability. Despite the fact that it’s a large-ish, mid-engined supercar, the NSX feels more like a small, mid-engined sports car in character; closer to an Elise, in other words, than the Ferraris it targeted. And although it is, of course, quicker than any sports car of its time, it isn’t outright power that’s the sell with this car. 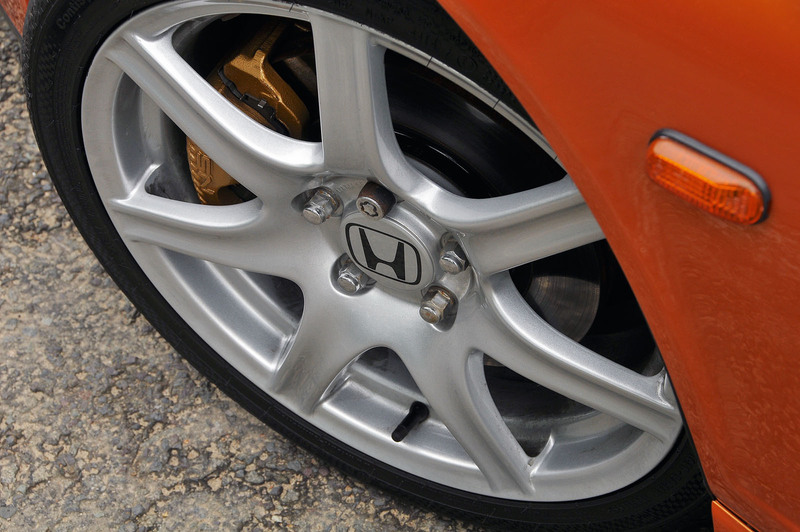 It’s the combination of that potency with the deftness of touch with which Honda imbued its first supercar. That, and the NSX’s famed friendliness, of course. Few cars today combine its approachability with its pace, let alone back in 1992, when it first appeared on the scene. This truly is a car for every mood and that’s a remarkably difficult feat to achieve. The NSX deserves its place in the pantheon of pastmasters not only because it’s a delight to drive fast but also because it’s a delight to drive slowly. It is the original usable supercar – and it’s still as beguiling today as it was on the day it was revealed. 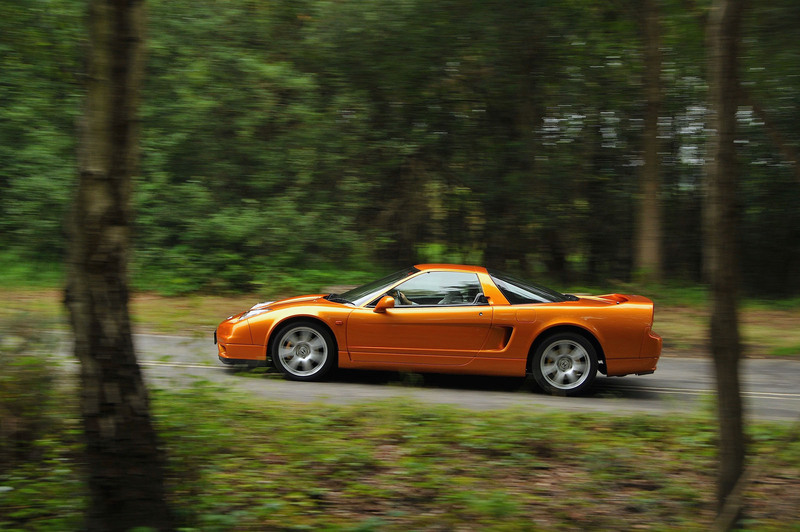 “I’ve always been impressed by the NSX’s design and engineering. It was underrated for a long time but now prices are storming ahead, especially for manual cars. Things to check include the condition of the ECUs because they’re old and suffer water ingress. Also, check the cambelt and clutch have been changed. They’re each around £2000, so either work that into the negotiation or make sure they’ve been done. ENGINE – Check valve cover gaskets, rear cam plug seals and the VTEC solenoids for oil leaks. The timing belt, water pump and camshaft belt pulley should be changed every seven years or 70k miles. Check alloy engine mounts by blipping the throttle and watching for excess movement. Test the performance hot and cold and listen for smooth VTEC operation. Check for coolant leaks from the header tank and that biennial coolant changes have been done. Inspect coolant hoses for wear and tear. TRANSMISSION – With the gearbox in neutral, depress the clutch and listen for input shaft bearing noises. If it’s an early 1990-92 five-speeder with a loose lever, a noisy ’box or it pops out of gear, suspect the countershaft bearing circlip and have it replaced — immediately. BRAKES AND SUSPENSION – Check for irregular tyre wear, indicating alignment issues. Rear tyres are only £120. A buzzing from the ABS system on start-up is fine but it should quickly fall silent. Track days can be hard on bushes, ball joints and bearings. BODY – Panel gaps and finish should be perfect. Aluminium is hard to work and difficult to repaint so check for filler, overspray and a poor finish. Lift carpets and check for factory-fresh seams. Ensure that early cars’ pop-up lights work and inspect the condition of expensive fixed headlights on later models. Check the conditions of all rubbers and seals, especially the windscreen’s, which was a weak spot. INTERIOR – Look at the condition of the Targa-style roof panel. Ensure the air-con and door handles work. Check the windows rise and fall because the motor and regulator are sold as one so aren’t cheap. Expect the driver’s side bolster to be worn on leggy cars. Manual NSXs may be the star of the show but prices are rising fast, making the less-popular auto a bit of a bargain. Among cars in average condition, an auto is around 20% cheaper than the equivalent manual. It’s likely to have had an easier time of things, too, although an auto was Senna’s daily driver. Best buy? An NSX-T auto. £30,000-£33,950 – Early, high-mileage 3.0-litre autos. £34,000-£39,950 – Lower-mileage autos plus occasional manual cars, and higher-mileage cars in top condition with few owners. £39,000-£49,950 – Broad range of lowish-miles 3.0-litre manuals, occasional imported Type Rs, mint standard examples nudging £50k. £50,000-£79,999 – Cherished, low-mileage cars, plus one or two ambitiously priced average ones. £80,000-£100,000 – Facelifted, low-mileage 3.2-litre models start here. Eight owners and nearly 120,000 miles but it’s the desirable manual with full service history and plenty of evidence of cherished ownership. It’s a UK-reg car supplied by a top specialist. Or, for the same money, an importer is selling a right-hand-drive 1991-reg manual with a claimed 35,000 miles, fully adjustable coil-over suspension and bucket seats.